What on Earth is going on here!? Black Friday is supposed to be the best day of the year to buy a new Instant Pot, and the main sale we saw last Friday was indeed a great one. 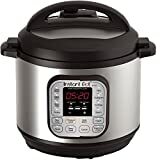 It shaved $42 off the price of the Instant Pot DUO80 8 Qt 7-in-1 Multi- Use Programmable Pressure Cooker, which is the largest available size of Instant Pot’s best-selling model. The deal sold out before the end of the day, just like we all thought it would, and new Instant Pot deals popped up in the days that followed. But then something surprising happened: It went back on sale on Wednesday with an even bigger $61 discount! Shockingly, this awesome Instant Pot is still available on Amazon right now at with this deep discount, and it’s the single best Instant Pot deal of 2018 — hands down. If you haven’t already gotten in on the action, hurry up and get one now before this deal disappears.